KAMPALA- About 17 days after the Age Limit ruling, Lawyer Male Mabirizi is at Supreme Court appealing against the Mbale Constitutional Court decision which validated lifting of the age limit. Mr Mabirizi, the dissatisfied lawyer of the presidential age limit ruling has listed 84 grounds challenging the judgment that validated the lifting of the same. 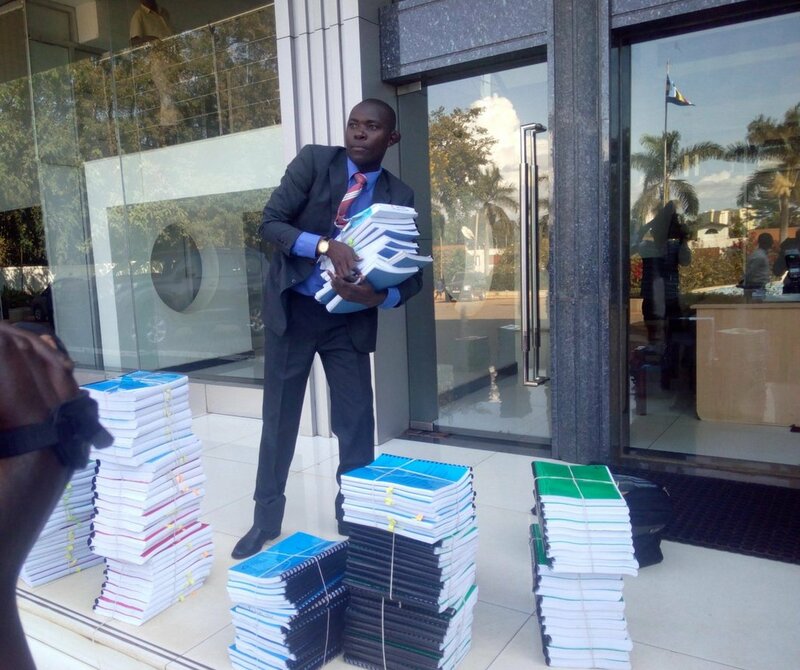 Mabirizi’s 30, 692 paged record has been delivered at the Supreme court on a pick-up and has been received by Deputy Registrar Godfrey Angualia Opefeni. Among the grounds ; Mabirizi faults the majority 4 justices of failing to address themselves on the provisions of the Constitution that require the Electoral commission to hold a referendum before carrying out any constitutional amendment. The Constitutional court ruled that it was not mandatory to hold a referendum since MPs who amended the Constitution are empowered by the people to make laws on their behalf. He also contends that the 4 justices erred in law when they held that the public was fully consulted by their representatives before amending the Constitution to remove the Presidential age – limit. The four justices include the Deputy Chief Justice Alfonse Owiny- Dollo, Remmy Kasule, Cheborion Barishaki and Elizabeth Musoke. Mabirizi further faults the Constitutional court for refusing to award him the Shs20 million as costs saying he never engaged a professional lawyer to argue his petition yet he contends that he incurred expenses like other petitioners. To this Mabirizi asks the Supreme Court to award him damages for inconvenience. Now with Mabirizi filing his full appeal, what is remaining is for the Chief Justice Bart Katureebe to appoint a panel of 7 justices to preside over the hearing. However Mabirizi is uncertain when his co-appellants; the 6 opposition MPs and the Uganda Law society will file their record of appeal having lodged their notices one week ago.